Hello everyone. I am a long time modder and recently I've been looking for a new RTS engine to suit a project I want to begin development on. 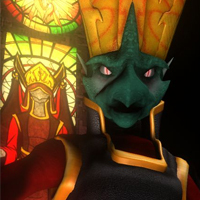 Some of my work includes Hyrule: Total War, Star Fox: Event Horizon, and the space based RTS called Sigma. - I've looked at the license for this engine, but I just want to clarify: Is it possible and legal to publish a game using this engine commercially, say using Steam as a platform? The conditions seem to imply that I can so long as the source code is made freely available, but I just want to make sure I am not misunderstanding. - Is is possible to slow the turn rate on units such as chariots and siege weapons? I'm not really a fan of such high turn speeds, and seeing as my game will involve more vehicles I'd like to change that. I notice birds taking their time to turn and bank smooth and slowly, so I imaging it's at least possible in this engine. - Are projectile weapons such as flamethrowers or a steady beam possible? I image workarounds by just having an extremely fast rate of fire, though I imagine the issue of the firing unit cycling through its fire animation very quickly coming up as a result. - Is it possible to build structures in different ways other then a civilian? For instance, I select a building and it has an option to add another building adjacent to it? - Is it possible to require a structure be in the proximity of another structure in order to build? 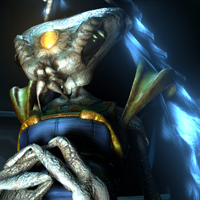 The best example I can think of are Protoss Pylons from Starcraft. I imagine it might be possible in this engine seeing as you can only build inside territory and other buildings such as mills seem to have area of effect buffs on nearby farms. - Is it possible for a civilian or builder unit to actually "build" other mobile units instead of bases? For instance say I wanted a civilian to build a spearman instead of a house, would there be any issues in the engine doing that? - Is it possible for a building to change the texture of the ground around itself within a certain radius when it is built? - Is it possible for a structure to periodically spawn units, gather-able resources, or other entities without player input? - Can the engine support more then its four current resources? If not, is it possible for the string descriptions of each resource to appear differently depending on your faction? For example to faction A the Food Resource appears as "Food" in text, while to faction B it appears as "Energy". - Can structures slowly generate resources? I notice that the corral currently in game says it is capable of doing so as long as sheep are garrisoned, though it seems that feature is currently disabled. Is there a way to enable it, and if so without needing sheep or other units? - Can map based/NPC factions with AI exist separate of playable factions? For instance one map could have a nest of wild creatures that create a handful of units and gather some resources, but otherwise doesn't expand past their initial base. Thank you anyone who is able to help out with these questions. I'm hoping my search for an engine has come to an end and 0 A.D. ends up being what I am looking for. It's a beautiful looking game and a perfect spiritual successor to Age of Empires. I will no doubt be playing it for weeks to come and spreading word about it even if it ends up not suiting my needs. actually dont support some , but is planned mostly of these features, even a suggest create adjacent building like terrans, I'm not sure about beans but the game is very easy to modding and add features ( you need a programmer) try to test some of our mods and visit our trac to learn how mod the game and the planned features, the game is very mod friendly. It's was suggested in the past add mostly of features of the popular RTSs in market features from SC2 , Age of Empires , Rise of Nations...etc. You can open topic to add these features are you request it. You must take a look at the LICENSE.txt file and, for each part of the code, read the corresponding license and see if you can. I think you can't for some though. But if the building is destroyed the effect disappears too, right? btw, welcome to the community! The source code is released under GPL2+ (if you build without the lobby, if you build against gloox it depends on the version of the license the version of gloox you are using is under (GPL3 with the latest releases)). If you distribute binaries (executables) you must provide access to the source code if someone asks for it (would be nice to have it publicly available without having to ask though). Some source code files are under different licenses that are compatible with the GPL and most of them just require you to include a notice that you are using code by those authors. So yes you can release a commercial (in the payment for the game and executables sense) using pyrogenesis. Nothing prevents anyone having paid for the game to obtain the source code and just release their own binaries for free however. The above covers the code side. On the art side you can use some other license that prevents others from distributing it. This assumes that you create all art from scratch (or you have the right to use it under some terms). This combination (free source and commercial art/data) is used by e.g. Doom, Quake, Duke Nukem 3D. Using art from the game requires you to adhere to the licenses the art files have (which is mostly CC-BY-SA3.0), and mixing your own art with that might or might not count as a derivative work so you should read those licenses really carefully and possibly ask a lawyer. That isn't doable with terrain, but as Stanislas noted it can be done with a decal. Using an entity with the decal, where in case of destruction of that entity (Health <= 0) it is replaced by another entity that has just the decal. Actually that should be quite simple. The simulation should need some small changes to add new resource types (mostly for gather rates and transport capacities), but apart from that it should already work. The GUI code might need some changes to nicely work with the new resources but that shouldn't be a lot of work. Of course to add this you will have to change a lot of templates. Having two different resources for different factions should work with some slight changes to some simulation code (or maybe even just some template changes). About the ressource thingy some time ago MuteLovestone added water as a resource. Digging in the mod subforum would give you more details. It should be avalaible on 0ADMods on github. I never tested it though and it was made for an old version of 0 A.D. (A15?) so I can't guarantee it works. Oh goodness, I've never received so much feedback and help so quickly in any modding community! Congrats on being the most immediately friendly group of people I've run into. Seeing as all my questions seem to have been answered with some form of "yes," I think I will most definitely use this engine. I've looked through the template files and found the faction json files and everything looks pretty easy to mod compared to other engines I've used. My only question left is if there is a tutorial floating around on how to import my own models and animations into the engine. I'm not familiar with the .pmd format the meshes seem to use and I'm wondering if third party software is needed to export models in that format, or if it can be done with a more common program like Maya (my preference) or MS3D? Currently most people use Blender with the built-in Collada exporter (also for animations). 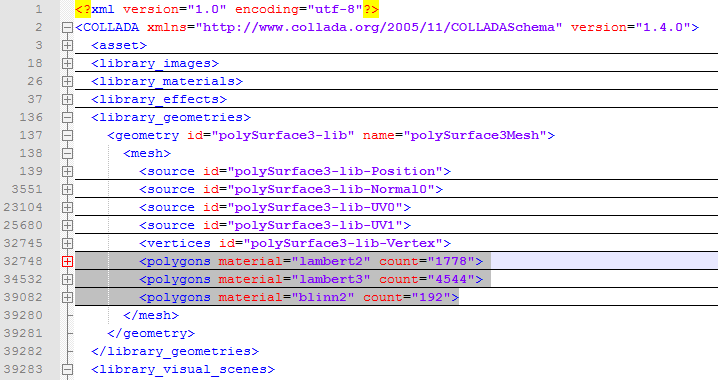 Maya does have a Collada exporter, so you can export them from here. If you need any help on how to import models, you can ask me, if you need some help on your project, I'm here too. My only question left is if there is a tutorial floating around on how to import my own models and animations into the engine. Everything is collada files, including the animations, iirc .pmd are binary collada files generated by the engine's archiver. Some files are of this format in the public art because they're really old. PSA are too There even used to be a 3Dsmax plugin for 3dsmax 6 to directly export them. I suppose I'll present my idea to those that are interested, perhaps I can get an idea if what I'd like to do is too much for the engine or not. - A race of reptilian humanoids on an exodus back to their homeworld. They've been enslaved for thousands of years and have recently discovered the lost technology of their ancestors. 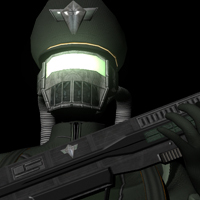 They are the most "primitive" of the factions, relying on old industrial technology and ballistic weaponry. I imagine them playing the most similar to the AoE/0A.D. format where they have a "Town Center" and civilians that move around and farm/gather resources. Food - They can build large factory farms and have workers gather from them. Fuel - They can build depots on top of fuel sources, they would automatically generate this resource. Ore - They can send in workers to gather various metal ores needed to construct buildings and vehicles. - Humanity has been long wiped out, leaving behind their human like but ultimately inhuman war machines. This militaristic superpower has spread across the cosmos like a blight, consuming entire worlds and enslaving any local populations. They lack guidance without their creators and are on a quest of nonstop war with anything that crosses their path. Being a race of machines I imagine them having abilities such as self regeneration right off the bat. They would likely not require any form of housing, and food is not a necessity. I imagine their troops being slow and reckless. Energy (Fusion) - The VRA can build power plants that generate the energy needed to power all their weaponry. - A collection of insectoid species that have formed a harsh yet harmonious capitalist society. They are extremely expansionist and while they have no political or racial agenda against any of the other powers, their hunger for resources and capital has put them at odds with their cosmic neighbors. I see them as a horde/swarm style faction, with a heavy reliance on really cheap drones early on in a game before they can afford larger and better units. I also imagine them being able to expand very quickly, setting up territory structures early on in a match. Food - They can build large factory farms and have workers gather from them. I imagine they can later upgrade their farms to generate food on their own without the need for workers. Ore - They can send in workers to gather various metal ores needed to construct buildings and vehicles. I imagine they can later build structures on ore deposits that automatically generate the resource. Currency - The Sov do not train or produce units: they buy them. Currency (which can be gathered from any precious stone on the map) is needed to hire soldiers and purchase vehicles from various corporations across the cosmos to have them shipped to the battlefield. - A race of extradimensional, supernatural beings that can bend and warp the universe in limited ways. Our three dimensional universe is largely a mystery to them, and they have set out to explore and examine it only to be caught up in a hostile war with everyone else. An exotic race that I don't feel would construct buildings normally. I imagine them having a central structure that grows a crystalline web around itself, spawning crystalline formations that the player can select and warp into the buildings they need. Yorulu Crystals - Mystical formations that warp the laws of reality around them, the Jevorons needs these in order to survive in our universe without becoming physical beings themselves. Their bases naturally generate these crystals in a radius around them, which workers can gather. - Giant, building sized flora that have been cybernetically augmented. They are a massive industrial power, converting entire planets into huge factories that pump whatever resources they can find dry. The best comparison I can think of for how I picture them are the factions from Battle for Middle Earth. I see them as having a building that "adds" buildings unto itself adjacently, so you sort of have this ever expanding single base. Seeing as they themselves are much larger physically then the other factions, they would have rather large, slow, and expensive units. H20 (Geothermal Vents) - The Ekoset's most precious resource is water, of which they need massive quantities to survive. They can build processors over geothermal vents to harvest automatically. Carbon (Lumber) - The Ekoset, having lost their natural ability to photosynthesize, convert other life into the fuel that they need to live. Energy (Solar) - The high tech industrial machinery of the Ekoset requires massive amounts of energy, they can build large solar arrays to power their units. 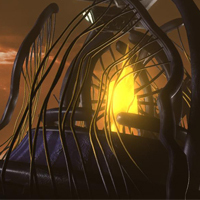 - A race of extradimensional nanoscopic machines, they followed the Jevorons into our three dimensional space. Unlike the other visitors, the Mylocks have examined our universe and studied it from afar for countless eons. I see them as a completely mobile faction: all their bases are slow moving units that can spawn more units. I'm not sure how well this would work since the engine seems to be territory reliant. 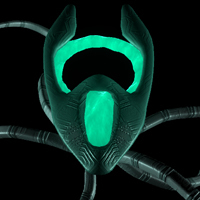 Ore - The Mylocks use whatever alloys they can to form themselves, harvesting them from planets they land on. Energy (Plasma) - Mylocks can generate superheated plasma with ease, which they need to power their units. - A giant, cosmos spanning super-organism that seemingly appeared from nowhere after the Jevorons entered our universe. 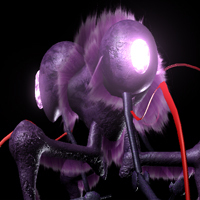 The Aabtani organism is a single massive life form, able to break parts off of itself to function as independent units. It moves across space and time, converting entire planets and every living thing it can find into crystalline formations that it uses to power itself. Like the Ekoset, I picture them as having one base structure that can continually add buildings adjecent to itself. Unlike the Ekoset they are smaller and more swarm/horde based. H20 (Geothermal Vents) - The Aabtani organism requires large amounts of water to warp and reconfigure the biomass it uses to form its units. Biomass (Lumber) - The Aabtani organism forgoes machinery in favor of re-purposing consumed biomass into the tools it needs. 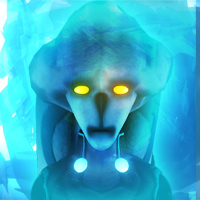 Yorulu Crystals - Unlike the Jevorons, Aabtani cannot generate these mystical crystals. I would like it if enemy units they killed actually transformed or spawned into these so that they can harvest them afterwards. Thank you very much, I'd like to try importing a practice model using Maya if possible. I'll probably contact you soon about it. Only being able to build in some territory is just a template setting. Roman Army Camps can even be constructed in enemy territory. Same for units producing other units, some heroes (a Mauryan and a Persian) and some ships already do that. Doable if you place those crystals unconditionally, or if some logic is added to check if some player is that civ/faction and only spawn it in that case. Something that might also work for this is what is currently done with Loot where the player destroying an entity gets some resources from it. What should happen if a player has no energy anymore? Should units just stop, and when/how can they be reactivated? Here's where I have to point those who are curious about modding 0 A.D. for the first time 0 A.D. Modding Guide It can lead you to answers for a lot of other questions. I would say yes, with caveats. Most units in game rotate instantly, appearing to turn is only a graphical interpolation (it has no effect on gameplay) and they really just point toward their target all the time. We do have a special unit motion for flying things, I suppose could be adapted to ground units as well, but it has no pathfinding per se. It's implemented as a mod script, overriding the default movement. However, I would really like these parameters to become part of the basic low-level unit motion. As you say, things like siege weapons, ships, and even charging cavalry can't instantly turn or stop. All things to consider in the pathfinder design. This is definitely possible, with the right modifications to UnitAI and the Attack component. It should be possible to have units that enter the Attacking state and remain there until ordered to stop or e.g. fuel runs out. Damage could be determined by having a range that is the length of the beam, find entities that enter that range, then filter them out if they're not in the actual path of the beam - no idea how severe an impact this would have on performance though. If there are a bunch of these proposed units, then you might want engine modifications to handle it more efficiently. Control might be tricky, there is no way to just point a unit in some direction without ordering them, unless we add some kind of "turn" control, this all depends on how you envision it behaving. Visually, I think the particle system may already be adequate for this, especially for flamethrowers (the flame would be a prop, selected by the attack state in UnitAI, nothing to do with existing ranged attacks that function quite differently), I'm not as sure about e.g. laser beams. They already do, notice the dirt, mud, or stone that appears where buildings are placed? You would have to be more precise about what you want, it will always be "possible", but maybe not easily or efficiently without some other changes. I've also tried using 3DS Max's Collada exporter but the same error comes up. The same thing happens using Maya's .dae exporter. The model and it's texture are in the correct folders. EDIT: Updated error message, I just realized there was more to the error message that vanished before I caught it. The error message sounds like your dae file contains multiple objects. Can you attach your (zipped) dae file here? Yes my model had multiple objects in it, I didn't know they had to be a single object. I merged them all and tried again, I got a new error: "Failed Requirement "mesh has single set of polygons""
I've attached my .dae to this post. <...> I got a new error: "Failed Requirement "mesh has single set of polygons""